OVANTY KOOB POD Starter Kit adopts a new and innovative design structure to separate the route of E-juice and air. Equipped with 1.5ml tank capacity and 1000mAh built-in battery, it can also help you refill E-juice easily without leakage problem. What’ more, it is eco-friendly and healthier. OVANTY KOOB POD Starter kit, with a Box shape, adopts a new and innovative design structure to separate the route of E-juice and air. Equipped with 1.5ml tank capacity and 1000mAh built-in battery, OVANTY KOOB POD Kit can support your ordinary vaping. 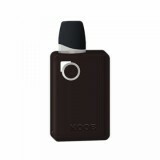 You will find it comfortable to hold and vape because of the ergonomic design of mouthpiece and MOD. The easy filling system will also help you fill easily without leakage problem. With new cotton structure and 1.5ohm coil, it will produce healthier and better flavor and cloud for you. What’s more, long battery life will support your long-last vaping trip. Come and get one, and start to enjoy your vaping. • OVANTY KOOP POD Kit and KOOB&KOOP Replacement POD are also available in BuyBest.